The Korat cat breed hails from Thailand where they are known as the 'Si-Sawat'. It is classified as a shorthaired, foreign breed and is a natural breed, meaning that man played no part in its development. 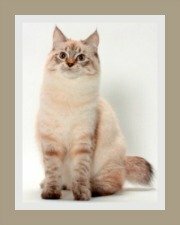 This ancient cat breed dates back to the 14th Century. They were named by King Rama V.
Legend has it, that he asked where these beautiful cats were from and the reply was 'Korat', a province in Thailand...and so these cats were named. It is believed that their ancestors are from the jungles of Thailand. In Thailand Korats are seen as a symbol of luck and good fortune and for this reason, these cats are often given as wedding gifts. 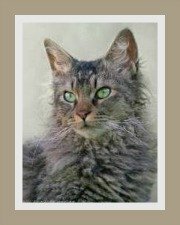 Their green eyes are said to represent the color of young rice seeds and therefore the symbol for good crops and their silver-blue fur the color of rain clouds, which signifies wealth. There is no doubt, that owning a Korat is bound to be a prosperous relationship! The first Korat cat breed was shown in Britain in 1896, but it was judged as a Siamese cat, and not surprisingly, a very poor quality Siamese! 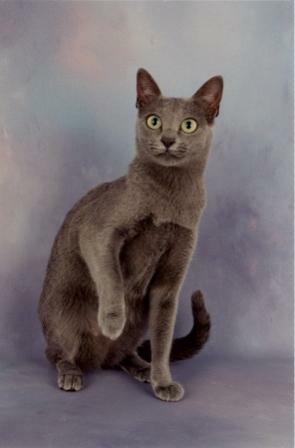 In 1959, the American ambassador to Thailand was presented with a pair of Korat cats that he sent back to the USA to the cat breeder Jean Johnson. Her love for these cats had started long before, as she had seen the cats on previous trips to Thailand. Ms Johnson also imported her own cats, Nara and Darra from a cattery in Thailand and so the Korat Cat breed was 'born' in the West. It wasn't until 1966, that the Korat was recognized by governing bodies in the West. 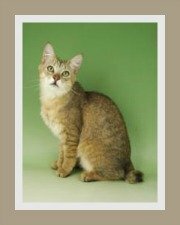 Korat cats remain rare cat breeds, even in the land of their birth, Thailand. 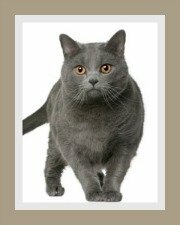 The Korat cat breed is a medium size cat, strong and muscular and yet supple, graceful and agile which allows them to move quickly. It has a medium-length heavy tail and well proportioned, heavily boned legs. The Korat's head is heart-shaped and its ears are large, round tipped and set high on the head giving the cat an 'alert' expression. Another distinguishing feature are its eyes. Wide open, round, large and prominent when open, but they do have a slight 'oriental' slant when closed. Kittens initially have blue eyes and then turn golden-green. 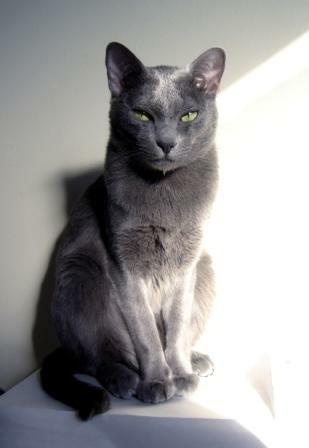 A mature Korat has peridot-green or luminous green eyes - the final color is only seen at around 2 years. The coat is special and not simply another 'blue cat'! The Korat has a single coat which is short, fine, dense, glossy and lies close to the body. The fur along the spine tends to part when the cat moves. This domestic cat comes in one color only. 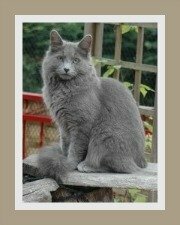 Any other color - and it's not a Korat! Blue-Silver tipping (or if you prefer, Silver-tipped blue), the roots are a lighter silver-blue, this darkens to a deeper blue further up the hair shaft, but as it reaches the tip - it turns silver. This unique coloring gives the cat a shimmering effects - almost as though the coat is frosted - sometimes referred to as an aura. The Korat is suited to indoor and outdoor living, but 'outdoors' as described below. (Many cat breeders have contracts that stipulate that the cat must be kept indoors only). Outdoors: An enclosed garden, one that is covered on all 4 sides and includes the roof. If your cat has direct access from your home to a large enclosure of this type it will be possible to allow some access to the 'outdoors'. These cats do adapt well to apartment living, but they need an 'adventure zone' to prevent boredom. Yes, provided that the children are gentle and not boisterous. Younger children should always be taught how to hold and play with cats and kittens. The Korat is a dominant cat and therefore prefers the company of humans rather than other cats. The Korat cat breed has exceptionally well developed senses especially those of sight, sound and smell. As they are sensitive to noise, they prefer a tranquil, quiet environment and tend to dislike harsh, loud sounds and sudden movements. 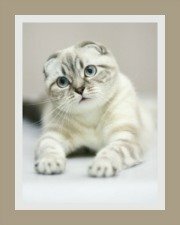 They are lively, playful, active cats, that prefer the company of their human owners to that of strangers and other cats. They are dominant cats, some say they are demanding and opinionated! Lovers of the Korat cat breed would disagree! Korat cats are a very talkative breed, with a pleasant melodious voice. Gentle and affectionate, they do love attention and will remain loyal to their owners. They respond well to and prefer gentle touch. It's for this reason that they don't make ideal show cats unless they have been trained to accept excessive handling since kittenhood. Intelligent, independent, strong-willed (what cat isn't) - cats that are very observant and aware of their surroundings. They love to get involved in household activities. The Korat cat breed is a low maintenance cat. Using a grooming glove or a rubber brush once or twice a week, will remove all dead hair without harming the coat. Bathing is not often required. Show cats should be bathed a week before show-day to allow the coat to recover its natural oils. Cats also need to be vaccinated against the normal preventable infectious feline diseases that all cats are susceptible to. We always suggest that cat owners invest in cat health insurance. Medical insurance can be a life-saver! The Korat cat does not require a special diet - but they do need to be fed a well balanced diet. The pet owner needs to feed their cat the best cat food they can afford - kibbles, semi-moist or canned. Raw cat food should only be prepared by experts but is a healthy alternative if the proper nutritional guidelines are followed. Fresh water, not milk should be available at all times. The average weight of the cat is 3.6 - 4.5 kg (8 - 10 lbs). Male cats are larger and heavier than the females. A healthy, well-cared for cat can be expected to live for 15 + years - they have a long life expectancy.